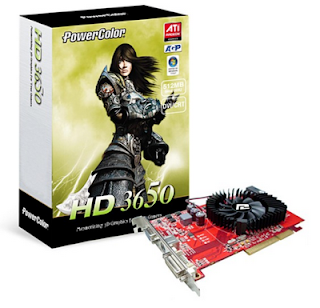 3 Days ago I purchased a brand new ATi Radeon HD3650 from PowerColor for my secondary desktop pc, as a small effort to upgrade it to today's standards. Hours later after doing some tests I decided to overclock it to check how it can really perform under higher clock speeds. And I can say the results are amazing for a budget mid-to-low-end AGP card like this. Retail Price was ~44 €/~$63. Now the rest of the system isn't much of a monster, you could most likely call it a teddy bear.. It includes an Intel Pentium 4 2,66GHz Single Core CPU, accompanied by a 1GB Ram on an Intel motherboard, plus a Creative SoundBlaster audio card. Graphics were available by a GeForce 2 MX400 64MB AGP card drawn on a 19'' LG1915S TFT LCD Monitor at a max resolution 1280x1024. So how much money should somebody put in a secondary system like this and expect a terrifying difference..? Well I decided to search for it and the only close solution I found in the stores nearby, was this PowerColor HD3650. Inside the box I found pretty much everything needed to install the card on a system, including the card, some manual, and a driver disk from PowerColor. The first thing I noticed after installing the card and booting straight into the Windows XP OS (drivers from the last VGA card were uninstalled before installing the card of course..) was that it was not supported by the latest official AMD-ATi drivers. So I downloaded those from PowerColor's official site which worked fine and started testing the card. I tried to do some game testing, and the results were pretty good. For example I tried Call Of Duty 2 with maxed settings except the options "v-sync" and "soften smoke edges" at a resolution of 1280x1024 and it ran really smoothly above 40 FPS. It also ran Splinter Cell: Chaos Theory at maxed settings at a resolution of 1024x768 ~30 FPS. I tried some more recent games too, like Mass Effect which didn't like the machine, it ran at a very low non-playable framerate with every detail off and a low resolution of 800x600 (below 10 FPS). I also tried Bionic Commando 3D which ran almost smoothly ~35 FPS only at the resolution of 800x600 but it looks ugly (this game does not have any option on details, only the resolution is adjustable). Finally I installed James Cameron's Avatar which ran horribly at a framerate below 5 FPS with all details off at the low resolution of 800x600, The card is able to run older games at maxed settings but it can't really handle new games that come out now even at the lowest settings. Let's not forget that it is a budget AGP card with 64-bit interface which totaly bottlenecks the 512MB memory.. plus the whole system is low-end with no overclock and stock cooling. Next thing on my mind was to overclock the card as is, with its stock cooling on to check its real maximum capabilities. ATi Catalyst only allowed me to increase the clocks at 10% overclock which was very bad, only 660 MHz for core and 440 MHz for the memory frequencies. At least I could enable the VPU Recovery option in case of failures to not have to reboot every time the system hangs. Afterwards I used ATiTool, which got the core temperature alright, but was not able to change the clocks at all. At least I was able to set the fan to run at 100% speed (there was no such option at CCC) and it was still very silent . It was not noticeable between the sound coming from other fans of the CPU or the Case. Next tool in my overclocking list was Riva Tuner which made it possible to adjust the speeds to critical levels such as 50%. I started by raising the core, stepping 50 MHz every time to check where it will freeze so that I use lower steps while I checked stability using ATiTool's spinning cube test. At default clocks I was getting an average of ~120 FPS there. The overclocking result was stunning... I got all the way up to 900 MHz and the system was stable! It never crashed at all! That could be called extreme overclock for such a card with stock cooling on! The spinning cube test in ATiTool was now reaching ~135 FPS. Now I wish there was a way to set it even higher.. Then I reset the core clock to 600 MHz and started clocking up the memory. It is DDR2, so I did not expect much there, but still I started stepping 50 MHz every time while testing it with ATiTool's spinning cube test. I managed to get up to 550 MHz stable and the VGA crashed when I set it to 600 MHz. Then I overclocked it making smaller steps from 550 MHz to find out that maximum stable frequency was 570 MHz with no crashes at all. It was great to find out that I was now getting ~185 FPS in ATiTool without artifacts at all! Then I moved to some more realistic benchmarking because results in ATiTool practically mean nothing. For this project, I think the most appropriate for a mid-to-low-end graphics card like HD3650 wouldn't be any other than 3DMark 2005. 3DMark 2006 would be too heavy for it plus it is very CPU demanding. I might give it a shot in the future. Now, the main score in 3DMark 2005 comes straight from the first 3 graphics tests, the following 2 just test the CPU which is not what we want to do, so I disabled those. I also switched off as many applications as I could so that I leave the Ram focus to the benchmarking. Also, I left the ATi Catalyst Control Center on so that the VPU recovery option is still available in case of a crash, to avoid restarting and losing precious time..
Now he've probably hit the max performance gain frequency of the card. I'll try some stuff out to check if we can hit the 5000 3DMarks barrier, although the results are good enough so far. Now for our overclock achievements so far, let's say that we got a performance increase up to 6 frames per second at the frequency of 782/560 MHz overclocked from 600/400 MHz default clocks. So as a result, ATi Radeon PowerColor HD3650 512MB AGP is a budget mid-to-low level gaming card which is totaly worth the money! It overclocks pretty well and if you don't want to spend extra money to get one of the latest AGP cards which are almost double the price it is your only fair option. You can get one of these for an older pc and make it able to play some recent games with light-weight graphics plus older games at maxed details. More 3DMark Tests and Game Benchmarks to follow up soon enough. Αναρτήθηκε από Solid Snake στις 3:40 π.μ.